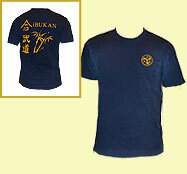 Aibukan Dojo is pleased to offer various clothing items with either the embroidered Dojo Emblem or the silk screened design for T shirts and Sweat shirts. 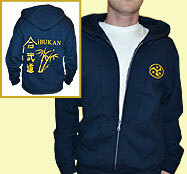 Dojo members may place orders with Warren Sensei for Aibukan Dojo logo merchandise. Please be prepared to provide him the item, size, and pre-payment. Be sure he has your name, best phone number, and current e-mail. 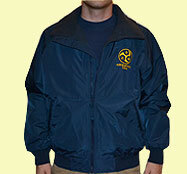 Additionally the vendor has said that they will also do an embroidered emblem on our Gi or uniform jackets. White Keikogi would be black embroidery, and Black or indigo dark blue would have gold embroidery like the clothing. Note the embroidery for hats and Keikogi would just have the dojo emblem without the English we have on the knit shirt and jacket. Estimates on the price of the Keikogi embroidery are around $18 to $20. Remember that Aibukan Dojo merchandise makes a nice gift for yourself or favorite dojo Budoka. 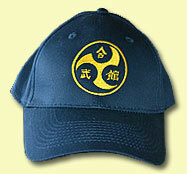 Baseball style cap with embroidered logo on front. 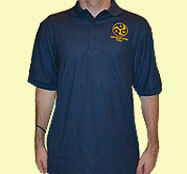 Knit golf shirt with embroidered logo on left side of chest. Weather resistent with fleece lining. Embroidered front logo. Zipper or pull-over with silk screened design front and back. T Shirt with silkscreened design on front and back.